Today's protracted asymmetrical conflicts confuse efforts to measure progress, often inviting politics and wishful thinking to replace objective evaluation. In Assessing War, military historians, social scientists, and military officers explore how observers have analyzed the trajectory of war in American conflicts from the Seven Years' War through the war in Afghanistan. Drawing on decades of acquired expertise, the contributors examine wartime assessment in both theory and practice and, through alternative dimensions of assessment such as justice and proportionality, the war of ideas and economics. This group of distinguished authors grapples with both conventional and irregular wars and emerging aspects of conflict-such as cyberwar and nation building-that add to the complexities of the modern threat environment. 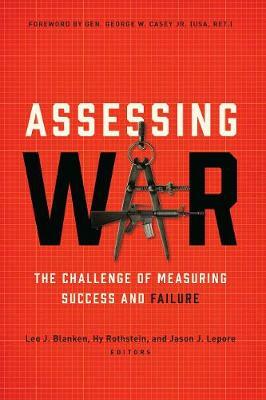 The volume ends with recommendations for practitioners on best approaches while offering sobering conclusions about the challenges of assessing war without politicization or self-delusion. Covering conflicts from the eighteenth century to today, Assessing War blends focused advice and a uniquely broad set of case studies to ponder vital questions about warfare's past-and its future. The book includes a foreword by Gen. George W. Casey Jr. (USA, Ret. ), former chief of staff of the US Army and former commander, Multi-National Force-Iraq. A timely and needed anthology. . . . A valuable book for serious students of strategy and military policy and is a must for readers interested in assessing military success.